The most fun you'll ever have reading about a (fictional) African dictatorship. Ngugi tackles greed, corruption, magic, and post-colonial politics with humor and imagination in this satire. His funniest book. 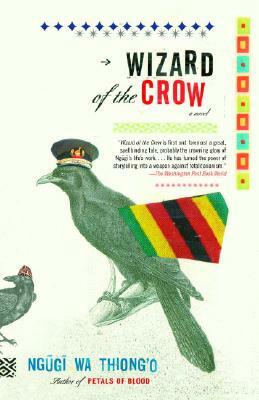 A landmark of postcolonial African literature, Wizard of the Crow is an ambitious, magisterial, comic novel from the acclaimed Kenyan novelist, playwright, poet, and critic. Set in the fictional Free Republic of Aburiria, Wizard of the Crow dramatizes with corrosive humor and keenness of observation a battle for the souls of the Aburirian people, between a megalomaniac dictator and an unemployed young man who embraces the mantle of a magician. Fashioning the stories of the powerful and the ordinary into a dazzling mosaic, in this magnificent work of magical realism, Ngugi wa'Thiong'o—one of the most widely read African writers—reveals humanity in all its endlessly surprising complexity. Ngũgĩ wa’Thiong’o has taught at Nairobi University, Northwestern University, Amherst College, Yale University, and New York University. He is Distinguished Professor of English and Comparative Literature at the University of California, Irvine. His many books include Wizard of the Crow, Dreams in a Time of War, Devil on the Cross, Decolonising the Mind, and Petals of Blood, for which he was imprisoned by the Kenyan government in 1977.